Granite countertops are all the rage right now in remodeled and newly built homes. Homeowners love the thick granite and how sturdy it is on top of being absolutely beautiful. They help the colors and textures of a kitchen stand out and are a great focal point to the room. Since granite is not the cheapest option, it’s important to note that if you’re going to spend the money investing in granite countertops, you don’t want to skimp on the rest of your kitchen including kitchen appliances. Homeowners sometimes have difficulty choosing the right kitchen appliances to go with their new kitchen countertops. The granite has such a strong presence in the kitchen that it can be difficult to know what to choose to compliment it without adding too much or too little when it comes to style and color of appliances. Many often opt for stainless steel appliances because it’s the “safe route” and will compliment any type of stone. Unfortunately, that can make your kitchen look like so many other kitchens out there and the point is to make your kitchen compliment your family’s style and taste! Luckily there are more options than just stainless steel. Yes, stainless steel is beautiful, but why put yourself in a box without knowing your options? With the options we are going to list, know that you can compliment, match, or contrast beautifully (as long as it’s not too contrasting from the natural stone) your kitchen appliances with your granite countertops. Black countertops – It’s a sleek and more modern look that blends well with a variety of granite countertops. It goes well with gray hues, light hues, and white. It’s fairly easy to clean and is super functional and won’t go out of style anytime soon. White countertops – White kitchen appliances look clean, timeless, and super bright against granite countertops. If you have a smaller kitchen, white can brighten up the overall look of the room without making it look like you’re trying too hard. White goes well with pretty much any style and texture of granite. Colored Enamel – Colored enamel appliances are classic and more traditional that can leave a kitchen feeling quite warm and inviting. There are several hues to choose from including gold countertops, rose countertops, and cream countertops, just to name a few. It is a great way to add charm and character to a kitchen. Stainless Steel – The always popular stainless steel is always a great option as well. Some homeowners just really love it so don’t feel bad if this is you! Stainless steel is gorgeous for kitchen appliances and is modern and classic all at the same time. The only drawback is that you can see every fingerprint and mark left on stainless steel so it may not be ideal for a big family with little ones that love to touch everything! If you don’t mind the frequent cleaning though, then go for it! 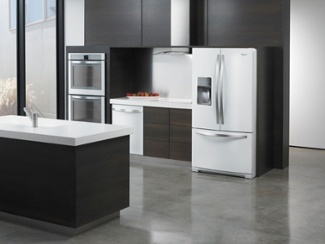 As you can see, there are many styles of kitchen appliances to choose from so have fun with it!